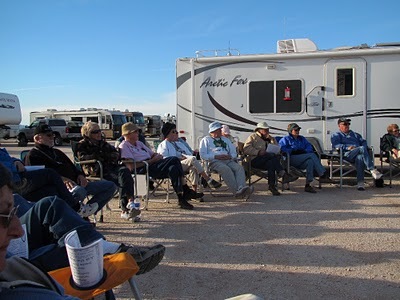 After our gathering at the Yuma VFW, the WINs moved on to Kurt’s gathering in his hometown of Wellton, AZ, just on the other side of the mountain from Yuma. I did not have far to walk to our 4:00 get-together right outside my door. 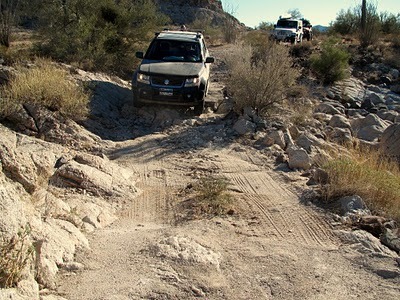 Kurt led us on a 100-mile trip down through the Barry M. Goldwater Air Force Range south of town. 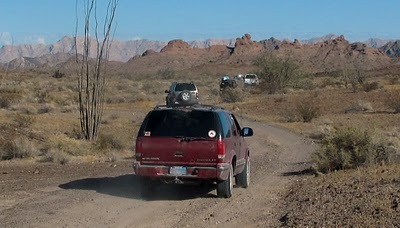 We went down El Camino del Diablo, the Road of the Devil, to close to the Mexican border. This road had been used since prehistoric times. 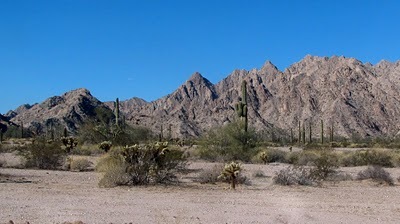 The cactus and mountains were just beautiful. 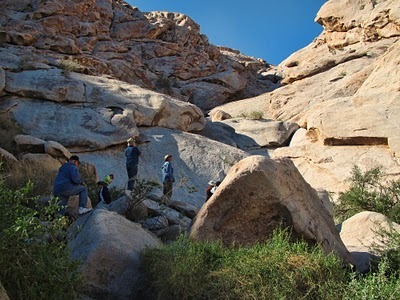 We stopped to look at the Tanks, where rainwater collects in many natural basins – usually! During the California gold rush, hundreds died here when they arrived to find the basins dry. 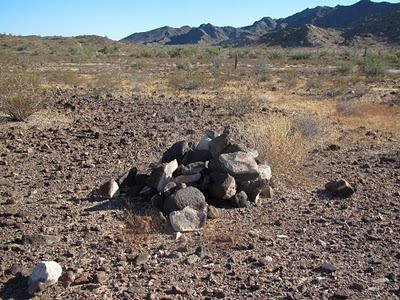 Some of the graves are still visible. 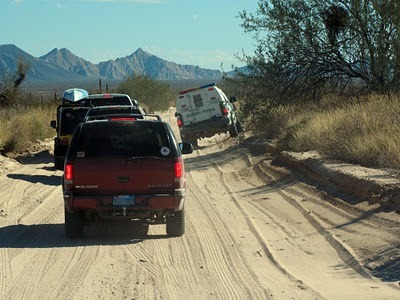 The only other vehicles we saw on the whole 100 miles belonged to the border patrol. 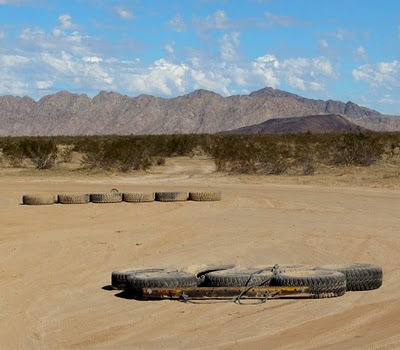 They drag tires on the roads so they can see the footprints of illegal aliens. There were some primitive campsites on the road. 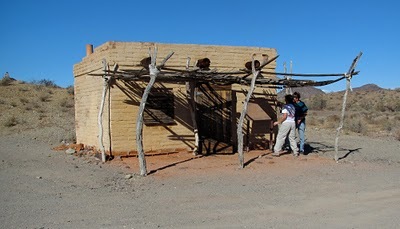 This is the casita at Tule Well Camp. Inside, I found this. I don’t know very much Spanish, but even I could figure out the translation. And we went by several of these rescue stations where illegals in danger can summon help. Of course, they’ll be sent back home, but at least they won’t die. 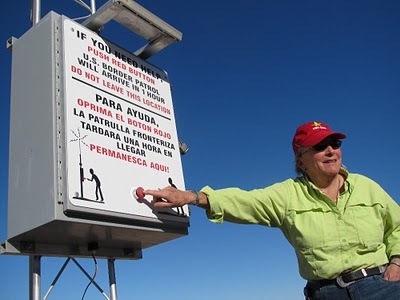 If you push the button, the border patrol will arrive within one hour. We found out they will arrive even if you don’t push the button. 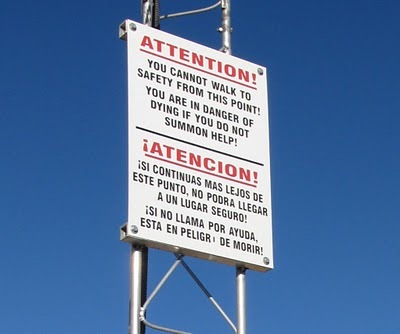 There are sensors all over the area that gave away our presence, and as we drove on, a Border Patrol vehicle arrived with lights flashing. 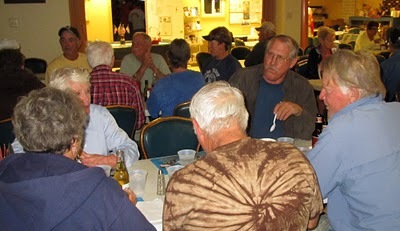 After all that excitement, we needed some dinner, so we stopped at the VFW in Wellton for their weekly Fish Fry. Excellent!